A simple dough and some tasty garlic chives filling make really good stuffed pancakes or pasties. This is a classic Chinese snack called jiu chai hur zi 韭菜盒子. In Chinese it means garlic chive box, box being the pastry. This snack is one I like to make for weekend brunch, simple and filling. What is garlic chive or jiu chai 韭菜? It's a vegetable similar to spring onion (scallion) but the green 'leaf' part is flat not hollow like spring onion. Here is a picture if you have never seen it before. This herb/vegetable has strong smell (especially when cut) between a garlic and spring onion. I have tried growing them in the garden but they never grow as tall as those bought. The young flower shoots are edible sweeter and more tender. Most Chinese grocery stores will stock garlic chives. Koreans love it a lot too. One tip for anyone buying and storing this vegetable, if the leafy part looks bruised and damp don't buy, it will rot very quickly, or if you have forgotten it in the fridge and it is rotting away, it will stink of high heaven. Another thing many of you may not know, if you have flies around your house, these little buggers will hover around your kitchen once you start cutting garlic chives. The strong smell will attract lots of them from nowhere. 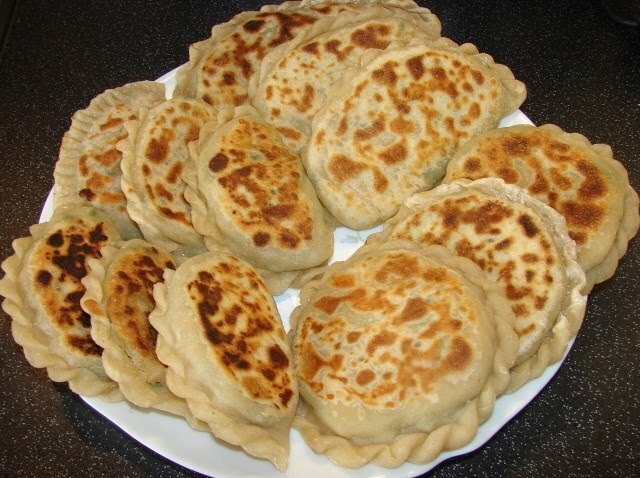 Here is the recipe how to make this tasty pastry snack. * many traditional recipes also add dried baby shrimps called sia pee or shrimp skin 蝦皮. Similar to dried shrimps but made from dried newly born shrimps with shell and head on. Like this. I could not find this at the grocery store, so I just leave it out. Put the plain flour in a large mixing bowl. Measure one cup (250ml) of boiling water stir in the salt and oil. Then pour this hot liquid all over the flour while stirring with a pair of chopstick or spoon. The dough will become lumpy with some dry flour left. Then gradually pour some cold water little at a time while stirring to evenly mix the dry flour into the dough. When you see little or no more dry flour left, stop adding more cold water. No need to knead, cover and leave the dough to cool down for about 15 minutes. Then knead till smooth, if the dough is sticky add some more dry flour to bind. Leave the dough to rest for another 5 - 10 minutes. To make the filling. Soak the glass noodles till softened, drain off water and chop. Add some oil to wok/pan heat till smoking, pour in the beaten egg. Stir, scramble and chop the egg till dry and separated. Remove and leave aside. Add a bit more oil, fry the garlic then add minced pork, stir till cooked through. Seasoned with light soy, salt, chicken stock powder and pinch of pepper. Leave egg and pork to cool. Rinse the garlic chives, shake off any excess water then chopped into 0.5cm wide bits. When the pork and egg are cooled mix in the garlic chives and glass noodles. Divide the dough into 2 equal halves. Roll into a 1" sausage shape. Cut into 8 equal pieces. Repeat the division with the other half of the dough. Total 16 pcs. You can also cut each small piece into halves for smaller or round stuffed pancakes or pasties. You can make big stuffed pancakes about the size of your palm or small dainty ones. Coat the dough pieces generously with dry flour. Set aside and cover to prevent drying out. Dust the working area with flour. Take a piece of dough, flatten it then roll into a thin round disc about 11 - 12 cm diameter. Put some filling on one side and fold the empty side over to make a crescent. You can lightly dampen the edge with water if required. Using fingers press the edges together. You can use a fork to press the edge to seal. To crimp the edge , gentle lift up the filled pancakes onto your palm. pinch the edge to seal then crimp. You can also make them into round shapes. Take two pieces of same size dough roll them into two equal round discs. Put filling on one. Put the other piece on top. Press to seal the edge. Then either seal with a fork or lift it up and crimp the edge. Fry the pancakes using a griddle pan or a large fying pan. You can fry without any oil or brush the pan with oil or add few tbsp of oil to pan or I like to brush the pancakes with oil first not the pan, less oily smoke during frying. To brush the stuffed pancakes with oil, put one on you hand brush one side lightly with oil lower this onto the hot pan with oily side down. Prick the top (with cocktail stick) a few tiny holes to let out any trapped air. Brush the top with a little oil. When the bottom is golden brown, flip over and fry the other side. Continue frying the other pieces. Can either cover the cooked ones with clean tea towel or keep in a cool warm to keep warm. ** If you don't mind the greasiness use more oil to fry, the pastry will be more crunchy. Eaten as a snack on its own or dip with some chilli oil or chill sauce. Nice when hot or warm . If you have any left over can keep in the fridge, lightly dampen with water and reheat in a dry frying pan or reheat in the microwave. Here is another similar stuffed pancake recipe. They look great Sunflower! Now I know what to make when my Mum is overrun with garlic chives in her garden! I'm not a fan and she always offers me some! I've seen the shrimp skins in the freezer at Wing Yip during a recent trip. I have seen shrimp skins at Raan Thai but they don't have stock at the moment. Will check Wing Yip when I go there. Hi, this looks great. Just wondering whether you can freeze them and fry later? Sorry for the late reply. I think it is better to cook them first before freezing. Just fry them in a shorter time till the pastry is just cooked. Let them cool before freezing. Freezing uncooked pastry can have few problems. One the pastry can stick together and two it can get a bit too sticky (absorbing moisture from the filling and ice) once defrosted.